A. Primary contact and maximum extension of the right rear leg, Which is the only support of the dog at this instant. B. Maximum Flexion of the Left Rear leg, Having just completed it's thrust, and now executing the follow through movement. C. Maximum flexion of the right front leg also in the follow through. It has just broken contact with the ground, in order to allow the right rear leg in it's extended movement to be brought forward without interference. D. The Left fore leg is reaching toward it's maximum extension. As the right rear leg begins to thrusts the body ahead, the center of gravity is propelled forward over the left front leg, which then becomes the main support. In the same instant, the right front leg and left rear legs are being brought forward. A. The period of suspension, immediately prior to maximum extension and contact of the right rear leg. B. The dog is suspended in air for a short period of time, during which he travels a certain distance in suspension, depending on speed. C. In a well-balanced, well-angulated animal, this phase of movement is necessary for the right rear leg in it's extension, to pass the front leg without deviating to the inside or the outside, or forging. A. Initial flexion of the right rear leg. It has just delivered it's thrust, and is entering the follow through movement. The body at this point is solely supported by the left fore leg. B. In the next instant, the left front will break contact, and begin it's follow through. This allows the left rear to extend fully without forging as it grips the ground.fpr thrust. 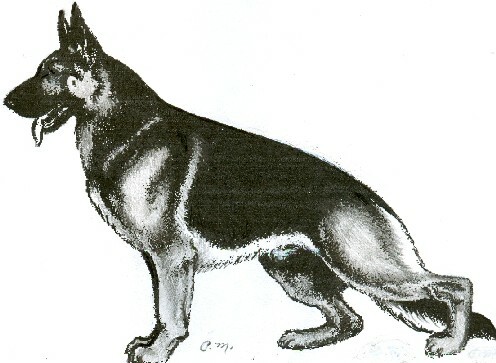 C. The center of gravity has passed beyond the contact point of the left front.as the body of the dog surges forward from the right rears thrust. D. The right front leg is reaching out, and in the next instant will ground. The center of gravity, and therefore the weight of the dog, will be thrust upon it as the left rear begins it's drive movement. This drawing is by Carolyn Martello. described in the official AKC Standard.